I have a confession to make: Until I began reading The Selected Stories of Mercé Rodoreda, I’d never heard of her. I knew nothing of her literary reputation, was unaware of her most celebrated novel (The Time of the Doves), and had read little (if any) Catalan literature before. This left me feeling both ignorant and eager. It reminded me again of the narrow and somewhat xenophobic breadth of my reading. How much time had I wasted watching television instead of studying world literature? But I was excited, too. It felt like standing on the edge of a literary terra incognita, encountering an unknown writer from a far-flung corner of Spain without any notions of style, taste or theme. This is something of a rare treat in an over-marketed, hyper-publicized world where books and writers are pre-determined for success and sales. Some of the best writing simply can’t be found on the shelves at Barnes and Noble. And here I was, poised to encounter a writer without context, without anything to influence me beyond words printed on the page. I wondered how many of the thirty stories in this collection I could read this way. Could I trust only what was written? Could I render a fair judgment solely based on my reading? How long would it take before I went scrambling to figure out who Mercé Rodoreda was? I’ll spare you the suspense. It took exactly four. Four stories before I went searching for more. Four stories before I leaned back on biography, criticism, and that missing context of someone else’s conclusions. Four stories before I reconstructed the narrative of the author. If you listen closely, you can hear Roland Barthes rolling over in his grave. My need for context—historical, cultural, biographical—says much more about me as a reader than it does about Rodoreda’s work. It highlights the wobbly and tenuous integrity of my own mind. And this worries me. To have become so addicted to someone else’s opinion, to rely blindly on the vetting process of culture, to turn the meaning structure over to the ‘experts’, these are most troubling signs. But I’m a product of a post-literate, ADHD world, a mainlining junkie of shortcuts, useless data and recycled opinions. Someone else judges which writers are worthy of my time, which books I should read, which thoughts I should think. Barthes, in his famous essay “Death of the Author,” objected to this type of thinking, calling it “the epitome and culmination of capitalist ideology, which has attached the greatest importance to the ‘person’ of the author.”(1) Guilty as charged. I could beat myself up all day, but here’s the thing: In this case, the context really did help. When I went back and read those first four stories a second time, then continued reading the rest, armed with some background about Rodoreda and about why her work mattered, I appreciated them more. It forced me to read her differently, with a keener sensitivity to what was happening in these stories. Context helped. Born in Barcelona in 1908, Rodoreda’s literary light flared early. She established a promising writing career in the male dominated Spanish literary scene of the 1930’s. Before the war, she published novels and stories and was a member of a prominent literary circle in Barcelona (The Sabadell Group). But history quickly extinguished that flickering light of her early fame. As the brutal Spanish Civil War swept across the country in 1936, Rodoreda worked briefly for the Catalan government before the Fascists’ oppression of non-Castilian culture forced her to flee. She moved to Paris, but it wasn’t long before another war encroached. As the Nazis marched toward the city in the late spring of 1942, Rodoreda found herself again on the run. In what must have seemed a cruel joke of history, she evacuated, this time south toward the city of Orleans under booming German artillery shells. (One of the stories in this collection, “Orleans, Three Kilometers” is a fictional account of this evacuation.) Eventually, she ended up in Geneva where she settled safely within the shelter of Swiss neutrality, but utterly cut off from her language and culture. She remained in Switzerland until the mid 1960’s, when she returned to Spain and stayed until her death in 1983. 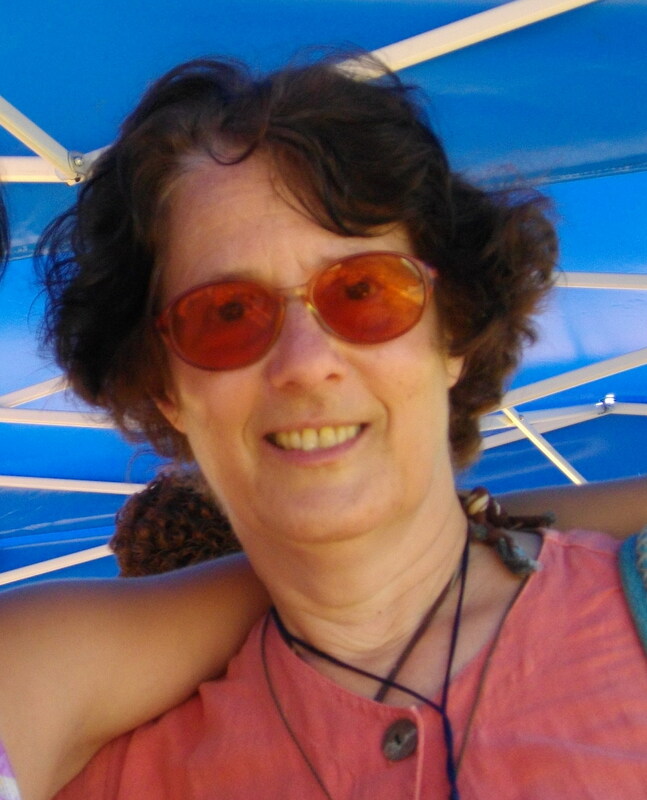 >Geraldine Cleary Nichols, in “Exile, Gender, and Mercé Rodoreda,”(2) describes Rodoreda as a ‘double outsider,’ cast out because she was both a female writer in a dominantly male world and a Catalan writer exiled to places where her native language was exotic. Nichols compares Rodoreda with Rosa Chacel, another exiled Spanish writer but one who wrote in traditional (Castilian) Spanish. Chacel also left Spain during the Civil War but went to South America where she was able to keep writing and publishing. Rodoreda’s exile stopped her writing altogether for almost twenty years. Nichols described it this way: “As a Catalan outside of Spain, Rodoreda was cut off from her language and her audience in way that Chacel was not.” Even in exile, a Spanish language writer (no less an English language writer: Joyce, Hemmingway, Eliot, et. al.) retained a broad audience; almost half the world speaks the language. But to write in Catalan, in that beautiful amalgam of French and Spanish, was to be a rare thing. Separated entirely from her community, she shut down. The stories in this collection were all published long after the war and after the two decade long silence which marked the time she spent away from her native soil. They are quiet and subtle, socio-psychological tales short on verbal pyrotechnics and long on character development. They sketch images of brooding lives, the outsider, the downtrodden, often living far from home. They hark back to the spirit of the great Russian writers of a century before her, Gogol and Dostoevsky. The word modest comes to mind. Not modest in scope or ambition, but modest in the rendering. Modest in the old-fashion sense of the word: humble, thoughtful, stories which seem to beg your pardon for taking the time to read them. These are stories best read on a Sunday afternoon train ride through the rolling Spanish hill country, a café con leche steaming next to you as white villages pass your window. They whisper about the horrors of the war but eschew bloodshed and scenes of battle. They offer poverty and crushing despair by presenting characters filled with hopes and dreams. They break your heart by making your root for the underdog who doesn’t stand a chance in hell. One of the first stories in the collection, “Threaded Needle,” tells of a seamstress, Maria Lluïsa, who stitches a bridal gown for a fat bride-to-be that she’ll never meet. It will take her thirty-six hours to complete the gown, but Maria Lluïsa will charge for forty-two. She mocks the bride-to-be’s taste and dress size. “I wonder what she’s like? Blond? Brunette? She only knew the woman’s size: forty-eight. She must look like a sack of potatoes.” There’s humor here, a cutting tongue and a street-savvy sensibility, traits which helped ensure survival during the ruthless Civil War. (The war is only mentioned once in this story, understatement being a frequently deployed technique.). But there’s also sadness and dreams of a better life. “She loved her job for many reasons; it allowed her a glimpse of a world of luxury, and because her hands worked mechanically, she could dream.” Maria Lluïsa imagines starting her own company, one where she will actually meet the brides, where she will be the boss and treat her employees fairly. She glanced down at the bridal nightgown. I wonder how it would look on me. She stood in front of the mirror on the wardrobe and tried it on. She was thin, and the nightgown was much too large for her. She tied it at the waist, held out the skirt with both hands, and spun around. >If I had married my cousin, I would have made myself a white, white nightgown. Just like this one. Notice the subtle tones, the muted images, the controlled pacing. Most of the emotion in this small scene comes from the repetition of the word ‘white.’ For Rodoreda, this is equivalent to a scream. A murderous fantasy, crushing poverty, and the humiliation of dreaming of a better life coalesce into image of the wedding dress she sews for the fat bride, beautiful and profane, elegant and sad. Throughout this book, we are given little hint of a better life awaiting the characters. Instead, only the warming light of Rodoreda’s having noticed them shines. She sanctifies their dreary destinies by writing down their stories. The most remarkable thing about Rodoreda’s biography, apart from the altogether mundane madness that was universal across Europe during the war years, is that for two decades, her writing went dark. A twenty year hiatus from writing splits her career right in its prime. What should have been, by all rights, her most productive years is shrouded in a mysterious silence. It’s not surprising, then, that the characters which populate her stories are like echoes of that time, voices crying out across that mute chasm of war, exile and isolation. Meager lives shackled to powerful forces and grander destinies. They wander landscapes like lost souls, with their ineffable longings, powerless against the mighty forces of politics and power which repressed. One of the longest stories (and my personal favorite) in the collection is “Carnival.” It tells of a chance encounter and unrequited love in the streets of Barcelona the night after a huge festival. Titania is heading home after and encounters Pere, a boy who immediately and hopelessly falls in love with her. He becomes her knight-errant, determined to see her safely home through rain, muggers and the drunks of Barcelona. But in pure Quixotic fashion, everything he does turns out wrong. With undertones of Joyce’s “Araby,” these young characters wander through the dizzying, nighttime city streets, trapped by love and shattered desires and the mystery of the life that awaits them. The story ends when Titania closes the door to her house, Pere left on the street to ponder the meaning of it all. The boy stood for a moment before the house, hesitating, suddenly feeling restored to the night, the street, to his most naked reality, as if the sound of the door banging had cut him off from another world. He had nothing left, only that silken touch on his fingertips, perhaps a bit of golden dust, the kind butterflies leave. I’ve fallen madly in love, he thought. Slowly he began walking beneath the trees. A gust of wind stirred the leaves around him. He felt the cold nipping the back of his thighs and instinctively felt for the rip. He started to walk faster. A stray dog spotted him from a distance, ran over, and started following him. An alarm clock rang on the opposite side of the street, disconsolate, as if trying to awaken a corpse. Open Letter Books has produced an expansive collection of Rodoreda’s stories here. The first twenty are pulled from her earliest collection, Twenty-Two Stories, published from Geneva in 1958. (One wonders why only two stories were omitted.) The remaining ten come from two later collections and express a wider range of style. She leaves behind the strict realism of the early work and flirts with different techniques and structures. In “Paralysis,” an unreliable narrator recounts a trip to the doctor in a vertiginous stream of consciousness style. “It Seemed Like Silk” tells of a woman who visits a local cemetery. Since she can’t afford the train fare to visit the actual grave of her dead lover, she picks a gravestone at random and imagines it to be his. An angel descends and takes her inside his wings. In the Kafkaesque “Salamander,” an adulterous woman is burned at the stake, but as the flames begin to singe her body, she transforms into a salamander. The salamander/narrator spends the rest of the story wandering around in the village and spying on her accusers. The collection is ambitious and comprehensive. It provides the reader with an extensive sampling of Rodoreda’s short fiction with a vast array of styles and themes. Barthes said that writing begins when “the author enters into his own death.” I’m not going to argue with many of the wonderful points that he makes in his criticism. His post-structuralist line of reasoning that says story should reign, not biography, and this makes sense. Yet reading a collection such as this, some half a century after the stories in it were penned, leaves a contemporary reader at a disadvantage. Maybe some writers do benefit from context. Even if this means that as a reader, I’ve lost the ability to wander in the wilderness without only my wits to guide me. These stories mattered more once I understood where they came from. In 1983, Gabriel Garcia Marquez published an essay in El País titled: “Do You Know Who Mercé Rodoreda Was?”(4) Marquez wrote the essay a week after Rodoreda died in Girona, Spain. He was saddened to find that such an important writer’s death was barely mentioned in the Spanish press and was ignored entirely by the international community. He implied (maybe even implored) that if we understood who she was and why her work mattered, we’d return to appreciate her work anew. In spite of widespread critical acclaim, she was often forgotten in her homeland. “Apparently few people outside of Catalonia,” Marquez wrote, “know just who this invisible woman was who wrote some wonderful and enduring novels in a splendid Catalan rarely found in contemporary literature.” Her anonymity puzzled Marquez because he believed Mercé Rodoreda to be one of Spain’s most important writers. That it took nearly forty years after the death of the Spanish dictator, Francisco Franco, for Rodoreda’s work to be recognized by a wider audience reminds us how minority cultures and voices are continuously shaped by the echoes of great violence and repression. It also reminds that Rodoreda’s reemergence is a tentative thing. It begs the question: how many other unknown, marginalized writers have been squelched? Without context, without the author resurrected, these marginalized voices may remain silenced and these stories lost for good. 2. Nichols, Geraldine Cleary. “Exile, Gender, and Merce Rodoreda.” MLN, Vol 101, No. 2. March, 1986, (pp. 405-416). 4. Marquez, Gabriel Garcia. “Do You Know Who Merce Rodoreda Was?” Trans. by David Draper Clark. World Literature Today, Vol. 81, No. 3, May-Jun 2007. While salivating my way through the most recent issue of Creative Nonfiction (the “food issue”), I encountered a discussion (some might say THE discussion) that continues to define (plague?) creative nonfiction writing in general. I am of course referring to the issue of accuracy. The old argument goes like this: on one hand, this is NON-fiction, so everything must be accurate, wholly accurate, and verifiable. On the other, this is CREATIVE, so bending, slanting, embellishing is just fine as long as the spirit of truth is upheld. You can’t [make things up in a memoir] but you can combine things… Certainly in “Tender at the Bone,” for instance, the best story is the one about my brother Bob’s engagement party. It’s a wonderful story, all true, but it’s really two parties conflated into one….. Nothing in there is made up, but it makes a much better story put all together in one place. I think one of the great things you get to do with memoir is selectively cherry-pick your memories. On March 3, 2005, four Royal Canadian Mounted Police officers were ambushed and murdered near Mayerthorpe, Alberta, north of Edmonton. I remember reading and reading through the reports I found on the Internet, at first mystified by how the massacre took place and then just shocked at the diabolical killing field the policemen had inadvertently walked into. Years before, in 1992, Marina Endicott, an old friend, a novelist and poet, settled with her Mountie husband, Peter Ormshaw (also a poet and journalist), on his first posting in Mayerthorpe. Luckily, they were long gone when the massacre took place. But the impact was huge. Marina’s essay “How to Talk About Mayerthorpe” is in the 2011 PEN Anthology, Finding the Words. The poems published here—“The Policeman’s Wife, some letters”—were short-listed for the CBC Literary Awards in 2006. 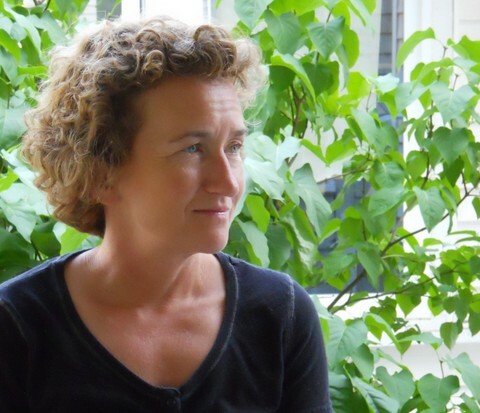 Marina’s novel Good to a Fault was a finalist for the 2008 Giller Prize, won the Commonwealth Writers Prize for Best Book, Canada/Caribbean, and was a Canada Reads book in 2010. Her new novel, The Little Shadows, about a sister act touring the prairies in early vaudeville, will be published this September. I desired my dust to be mingled with yours. a coddled egg in a china cup. blue plums in a spilling pile. a gelatin pearl, it will melt. in a separate room, a yellow room. A saint over the door. I can hear them calling, way from Oregon.. The Fourth of July: I’m uncertain about what this holiday means to me anymore, or if it means anything at all beyond crowds and jammed freeways. But this is no good. This is no good because it’s an attitude which shuts down something deeper, which forgets the simplicity of being young, when the day was un-examined and alive: barbecues and swimming pools, flapping flags and a night sky filled with fireworks. I feel the need to give my own kids something better than a smug dismissal of this holiday, even as my inner-cynic chides and warns that I’m perpetuating the machinery of our commercial culture. How to find a way to embrace the day, to provide my kids (and, no less, myself) a cultural framework, a sense of place and community, beyond simply filling my shopping cart with hamburgers and hot dogs like some living, breathing cliché. Who knows? I turn toward Van Morrison for help, toward an album I refuse to listen to for eleven months of the year but play it in the days leading up to the Fourth of July, like some self-imposed sacrament against my unwillingness to celebrate the actual holiday. The song, “Almost Independence Day,” was recorded on the album Saint Dominic’s Preview, when I was only three years-old. I discovered it within my father’s massive record collection. Maybe I was nine when I first heard it, my daughter’s age now. I’m not overstating it if I say that I fell in love with music that day. Ilistened to that album over and over. “Almost Independence Day” is the last track. The song begins softly, with the plaintive Irish troubadour moaning in tune with his twelve-string guitar across a sparse silence. A Moog synthesizer comes in and imitates foghorns echoing across the San Francisco Bay. The opening instrumental riff continues for more than a minute. The song itself spans just over ten, filled with haunting, repetitive vocals structured like some wild chapter out of Joyce. We go steppin’ way out on Chinatown. All to buy some, Hong Kong silver. We go out on the town tonight. Here is another first for Numéro Cinq: A full length film script from R. W. Gray (who earlier appeared on these pages as the author of the stunning short story “Crisp”). Not only do we have the original film script for Alice & Huck (who else publishes movie scripts these days?) but we also have an excerpt from the movie, teaser and fan videos. This is a wonderful chance for readers to compare script and the made movie (you can get the complete DVD here; the IMDB movie page is here), a chance to see words embodied in the actors’ gestures and words (a transformation of text to stage that is always a mystery to me). 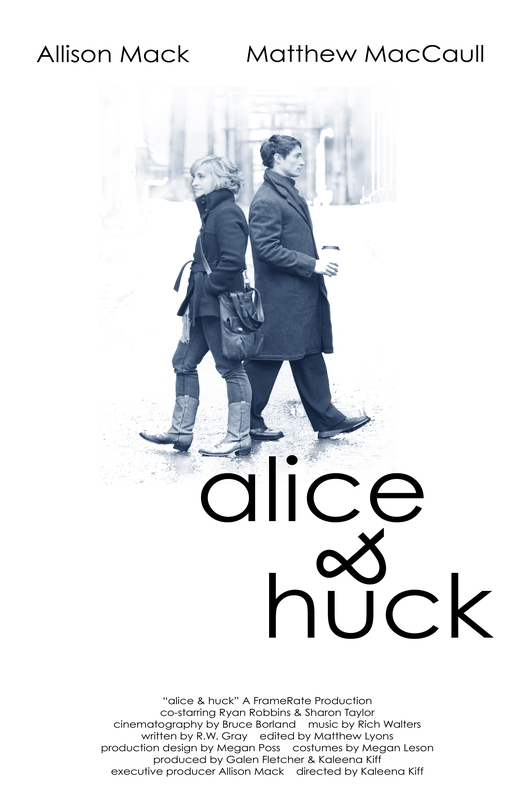 Alice and Huck is a delightful, whimsically romantic love story of close encounters, near misses and second chances. 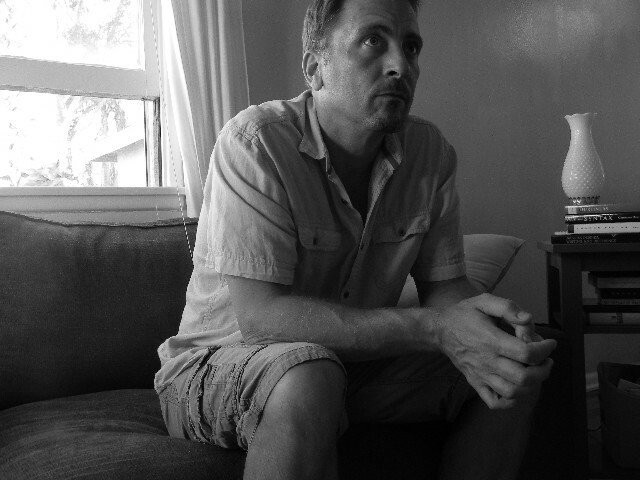 Robert Gray was born and raised on the northwest coast of BC, and received a PhD in Poetry and Psychoanalysis from the University of Alberta in 2003. 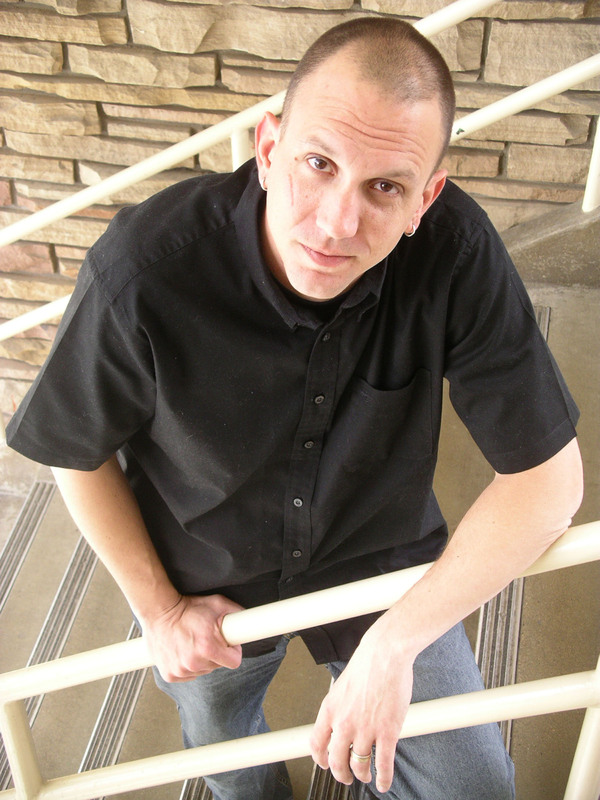 He is the author of two serialized novels in Xtra West magazine and has published poetry in various journals and anthologies, including Arc, Grain, Event, and dANDelion. He also has had ten short screenplays produced, including Alice & Huck and Blink. He currently teaches Film at the University of New Brunswick in Frederiction. What is Alice & Huck about?